A wonderful addition to the Amazing Moments Agency, Lana is the main Face Painter at Amazing Moments Agency and a favorite for kids, parents and corporates alike! Lana has performed for McDonald's, Dunkin Donuts, Campbell Soup and Goya Company picnic events as well as for Verizon Wireless and Rutgers University Home Coming events and more. Watch as your children are captivated by Lana's skillful, creative, and colorful creations on your child's face, hand,or cheek. She can do about 50 designs from sports, cartoons, glamour, and princess, as well as drawing on her highly creative imagination to create something truly eye-catching and fun for your child!Lana is really an aspiring artist. She loves art of every shape and form. Very often she meets people at the parties she works that have an artist soul just like her. You may have never thought about it but even adults LOVE face painting. Sometimes they're a little shy but we're all kids at heart. ​Lana often paints her face when she goes to a party just so that whoever is a little shy, has never had their face painted before and doesn't know if it's something they want to try can see how pretty and fun it can be and give it a go. A little face painting and some glitter can bring so much fun to your party and Lana loves the amazed expression on little kids faces and laughs with them and enjoys the whole experience just as much as the kids do.She is also very good at interacting with the kids in a gentle, patient manner that is making her a must-have for any children's birthday party! See her beautiful handiwork below! Glitter Tattoos are beautiful, shinny, long lasting and eye catching! They are a great alternative for your parties and events. ​They attract younger and older kids, teenagers and adults alike. They are great for pool parties since they do not wash off and can last for various days with proper care or can be removed with rubbing alcohol or baby oil if so desired. Glitter tattoos are applied by wiping the application area with alcohol to remove any body oil or impurities, applying a stencil of your desire (our artists have an extensive menu of designs to choose from), body glue and then glitter of different colors. What better way to celebrate than sprinkle a little glitter to your parties. Check out the video testimonials below! "This party was for my daughter's first birthday. Having Lana there was one of the best decisions for the party I made! All the kids absolutely LOVED the face painting AND Lana herself. Her talent is unparalleled. We were extremely happy with the results and will be using Amazing Moments again. Thank you for all you did to make this party a success!" ".... Lana, Thank you so much for wowing everyone in attendance at Dawson's 4th birthday party.... The face painting was fantastic - The best I think I have ever seen.... You all did an outstanding job keeping the children engaged in the entertainment. "Lana was AMAZING!! 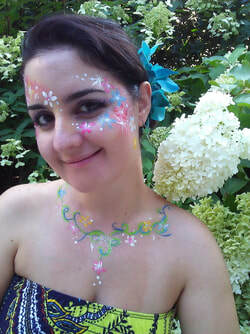 we had her for a party at our home and she did the most fabulous face painting and balloon designs. She was awesome and so great with the kids and adults!!! Thank you!! U will hear from us again!" We hired Lana and Mike for our daughter's first birthday party. Face painting by Lana and Magic show by Mike was phenomenal. I will definitely have him and Lana at my next event." "They were incredibly flexible, kind, entertaining, and reasonably priced! I hired a magician (Michael) and a face painter (Lana) for my daughter's 5 year old birthday party. They were there on time and very professional in appearance and attitude. The kids loved the interactive magic show including a real bunny rabbit, and they loved loved loved the face painting! I got so many compliments from other parents! They made my daughter's party that much more memorable for her, me, and our guests. I would and have recommended them to my friends and family."